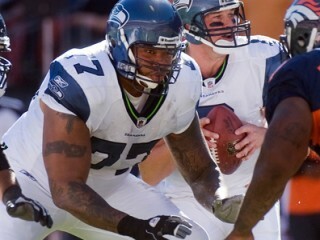 Stacy Andrews is an American football offensive guard for the Seattle Seahawks of the National Football League. He was drafted by the Cincinnati Bengals in the fourth round of the 2004 NFL Draft. He played college football at Mississippi. Joined Seattle on September 5, 2010, via trade with Philadelphia in exchange for an undisclosed 2011 draft choice. * Originally drafted by the Cincinnati Bengals in the fourth round (123rd overall) of the 2004 NFL Draft. * Played in 10 games (two starts) in 2009, missing six games due to injury. * Designated Cincinnati’s franchise player in 2009 and started 15 games at right tackle that season before suffer- ing a knee injury at Cleveland (12/21/08). * In 2007, saw first significant action as starter, beginning the season as the team’s starting left guard before shifting to right tackle following the sixth game of the year. Part of offensive line that set a team record with fewest sacks allowed (17). * Started first three games of career at right guard in 2006. Did not begin playing football until he was a junior at Ole Miss in 2002. That year, he walked on to the team and was subsequently red-shirted. He then appeared in five games as a senior in 2003. Was an All-American performer in track and field at Ole Miss and holds school records for indoor weight throw (68’ 3.5”), outdoor hammer throw (201’7”) and discus (188’5”). Attended Fairview HS in Camden, Ark., where he was a three-year letterman in track and basketball. His brother, Derrick, is a sergeant in the army and just finished a term in Kuwait. Brother, Shawn, was selected by Philadelphia in the first round of the 2004 NFL Draft. Majored in Art. Resides in South Jersey with his children, Stacy and Stacia. View the full website biography of Stacy Andrews.